Tuesday, 10 July 2018, 12:12p.m. The man who robbed a woman of her wallet as she lay severely injured in her car following a crash - and then went on a spending spree with her credit card - has been jailed for 12 months. However he cannot be identified because he is seeking permanent name suppression - on the basis of his mental health, the impact to his mother's reputation and the threat of a community backlash - and the judge considering the case cannot deliver his decision until September 12. Due to the fact that he has been in custody since the start of the year he is likely to be released from prison any day. On November 2 last year Shevaughn Johnstone was seriously injured after a collision with a truck on Cosgrave Rd in Papakura. 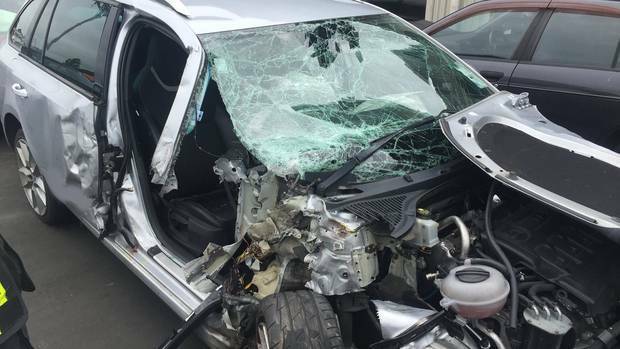 As she lay in the wreckage, a 32-year-old South Auckland man, posing as someone trying to help her, rifled through Johnstone's handbag, stealing her iPhone 6 and wallet. He then left the scene and proceeded to drive around petrol stations in Papakura, Takanini, East Tamaki and Botany Downs using her card to make more than $500 of purchases. In February the man pleaded guilty to theft, fraudulently using the credit card and a raft of other charges including driving while disqualified, drink driving, breaching community work, failing to answer bail, providing false details. He was also charged with breaching his sentence of intensive supervision, which was in place when he robbed Johnstone. In the Manukau District Court yesterday, Judge David McNaughton sentenced the man to 12 months in jail. But given he has been in custody since the start of the year, he will be released within days or weeks as the bulk of his time has already been served. Judge McNaughton said the theft of Johnstone's property was "opportunistic". "You took full advantage," he said. "It was quite amoral and shockingly callous." After sentencing Judge McNaughton turned to consider the man's bid for name suppression. His lawyer Devon Kemp argued there were three reasons the offender's name should never be published. He said publishing the thief's name would cause extreme hardship to him, his mother and her workplace. It would also cause physical or psychological harm to the man. Kemp said his client's mental health was fragile and he had a history of "significant" issues including depression, bipolar disorder and attention deficit disorder. He had attempted suicide on multiple occasions, a long-standing drug addiction and "a traumatic personal history". Kemp said there was "a real and appreciable risk' that naming the man would "cause him to commit suicide". Further, if his identity was published he would be "targeted by members of the public in either a violent way or a way that will significantly exacerbate his mental health". alongside security footage of the man released by police during their investigation - by Johnstone's partner. That post was then shared widely on social media and was met with outrage and harsh comments from the public. "The defendant has already suffered as a consequence of the Facebook posts being published," Kemp said in his submissions. "While his name was never published… the CCTV stills were sufficiently clear for people who knew him and his family to identify him. "The post has received numerous 'likes' and has been shared over 15,600 times." Comments on the post - not connected at all to the Herald's published stories or social media - included the man being called scum, a "gutless coward', a "true piece of sh*t", a "f**ken low life c**t". Kemp also submitted that his client's "capacity to rehabilitate" would be "significantly compromised" if he was named because "other individuals at… rehabilitation programmes will be made aware of his offending and respond similarly to those who have responded on Facebook". Kemp said his client's mother would also suffer "extreme hardship" if he was named, as would her employer. She works for a community organisation and affidavits from her and a colleague were presented to the court outlining how both the mother and organisation's reputations would suffer if her son was named. According to the affidavits, the mother is a "figurehead" of her organisation and if her son was named both the reputations of her and her workplace would be "tarnished". It would also cause people to doubt her ability to be a role model and result in investors and customers being "hesitant" to engage with the organisation which would have a "devastating" impact on its income. Further, it was likely she would have to resign if her son was named and the loss of her job may cause her "extreme hardship". The mother's affidavit also revealed details of her son's turbulent upbringing and gave insight into what led him down a path of criminality. His father was a patched gang member and "became abusive". "[He] witnessed a lot of that," his mother said. "[He] occasionally got a hiding from his father but I would not characterise it as beatings. "The abuse was mainly against me. "His father was constantly drunk. He sold drugs on behalf of the gang." She broke up with her son's father when he was 13 and the youth was sent to live with relatives. He moved back in with his mother at 16 but her new partner "regularly flew off the handle" and also became abusive. When her partner assaulted her son's best mate, the teenager moved out of home. "It was then he started getting into more serious drugs," his mother said. Her relationship with her son deteriorated - he blamed her for the "hurt" in his life. But when he lost a job painting houses he was forced to move back in with his mother. "He began stealing, lying and cheating to fund his lifestyle because he had no work," her affidavit said. She said she loved her son but did not know how to help him, and that he hated her for "what he had to go through". But she feared his offending against Johnstone would harm her own reputation and she implored the court to take that into consideration. "I am concerned [his] actions will result in a public perception that my reputation is contradicted," she said. "The publication of [his] name will mean that his actions will negatively affect myself, my work, Maoridom and our community. The Herald disputed all claims of extreme hardship made by the man and his mother, stating those arguments were "clearly outweighed by the presumption in favour of openness and the right to receive and impart information". The Herald submitted that suppression could not be justified in the face of the presumption in favour of open justice - particularly given the seriousness of the man's offending and the fact he had pleaded guilty. "[He] is pleading guilty to charges whereby he will have to accept the embarrassment and damage to his reputation for committing such offenses," the Herald argued. "On the evidence provided, while there may be some discomfort - even undue comfort - in respect of [the mother] and [her workplace], the speculative evidence presented does not displace the presumption of open justice, nor does it illustrate a real and appreciable risk of extreme hardship so as to require name suppression for [the man]. "The public have a legitimate interest in being informed about the guilty plea and sentencing of [the man], particularly the arguably aggregating factors in respect of his offending against Ms Johnstone. media coverage to be fair, balanced, and factually accurate." Judge McNaughton said he had not had time to properly read the submissions from Kemp or the Herald and after hearing the arguments, said he would reserve his decision. He questioned whether there was even public interest in reporting the man's name. whether he would genuinely be in danger if he were to be named. Judge McNaughton said he did not have time to prepare his decision until August 27. He would then deliver it in court, with the offender and the Herald present, on September 12.